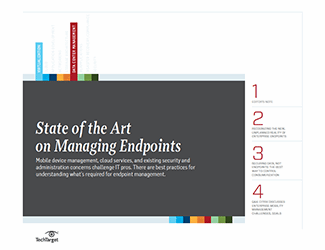 For several years in a row, experts predicted that it would be the "Year of VDI," but that never truly came to fruition. Instead, the industry seems to be readying for the Year of DaaS. To that end, it's important to know how desktop as a service and virtual desktop infrastructure work together. Enterprise IT should also know to pick a provider, work out a mutually beneficial service-level agreement, and what security and compliance issues to be aware of. Get the answers to all those questions and more in this e-book. 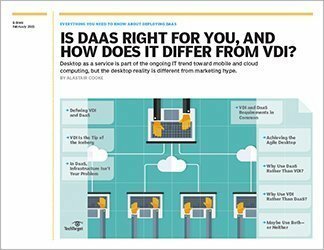 Is DaaS right for your organization, and how does it differ from VDI? Desktop as a service has been around for more than 10 years, and there are shops that have been doing it for that long. But the lack of widespread adoption of both VDI and DaaS makes it difficult to predict how one might affect the other, and whether either will ever really take off. Depending on how you do it, desktop as a service (DaaS) has the advantage of fairly low and predictable costs. Still, some deployment models can up the price tag considerably when shops are forced to factor in Windows licensing costs. If you want to host Windows client OSes, such as Windows 7 or 8, you have to bring your own Software Assurance (SA) or Virtual Desktop Access (VDA) licenses; there isn't a Service Provider Licensing Agreement (SPLA) for VDA, which shops need to run Windows client OSes. That makes hosting Windows 7 desktops about as expensive as doing VDI in-house. There is an SPLA for Windows Server operating systems, however. Using that model is how companies can keep DaaS costs low and predicable, but they do so at the risk of application compatibility issues that come with using server-based OSes. What's more, it doesn't benefit Microsoft to set up SPLA for VDA, so there might not be a fix in the near future, even despite changes to SA licensing rules. Cloud and desktop-as-a-service providers have ways to keep your money once you subscribe to their offerings. When you sign on the dotted line, you get the assurance of a service-level agreement (SLA) that guarantees uptime for your hosted desktops, but the deck is usually stacked in the provider's favor. In the end, your SLA could leave you out of luck. No service provider can promise true, 100% uptime; technology has limits and things break. But providers also build contracts to include lots of exclusions and criteria that must be met to warrant a service credit in the event of an outage. That's why it's so important to grill potential providers before you select one, and make sure you cover all your bases with your SLA. Know what you're signing up for, and try to negotiate a better SLA if you can. Public cloud providers won't budge much on their terms, but managed service providers and private cloud hosting vendors are more likely to work with you -- for a price. 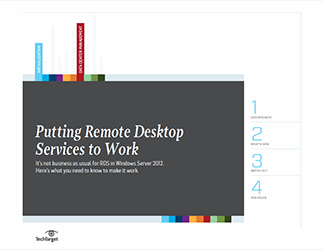 Desktop as a service (DaaS) lets businesses deliver desktops and applications to users from the cloud. The advantages include less management for IT and a steady, predictable subscription-based cost model. But companies that have to meet security and compliance requirements must think carefully about whether DaaS is the right delivery method for them. Shops with very strict requirements may find that it won't. If that's the case, they can turn to on-premises virtualization or stick with physical desktops. They could even choose to use DaaS to deliver only some users' desktops based on their departments or job roles. DaaS came of age in the Internet era, so providers build isolation and protection against hackers into their infrastructure. They can do it better, faster and on a bigger scale than most IT shops can on premises. 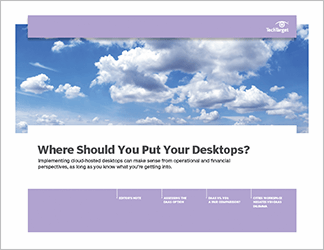 Still, the concerns around multi-tenancy and meeting specialized needs should be top of mind for companies considering cloud-based desktops. Where should you put your desktops?